I was reading a New Scientist book review about working at DARPA. 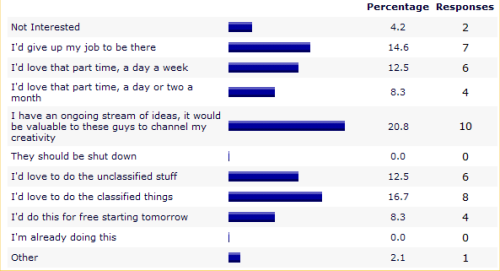 So I ran an online search for survey tools. I took the third one (mainly because I couldn’t see how it ran without giving it a try) and created a survey. I put a j.mp link (which is the same system as bit.ly) to it on the New Scientist site and went away for a day. The next day (2009-11-14) I captured the results again. This time there are 27 responses. Here’s what they look like (as computed by the service). The percentage numbers are worked out in an odd way. I make the “I have an ongoing…” question ticked by 48% of participants so multiply the percentage column by about 2.4 to get % of respondents. The results look much the same though we now might have one response from somebody working at DARPA or a similar place. 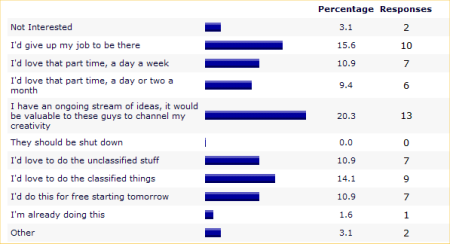 This isn’t a scientific survey as much as exploring an idea to liven up the web. The sample size is small, 27 respondents. The readership who responded seem overwhelmingly to like the idea of what DARPA does. A lot of them think they would make a good contribution. One of the other responses is basically saying he would like to do the unclassified work and would not be prepared to do any classified jobs. A fair number indicate a willingness to do this for free, I’m not sure how that would stack up if they were actually offered the opportunity, but it does seem to show a high level of enthusiasm. I would prefer a different analysis to that automatically calculated. I found a few reviews of these poll / survey systems after I did this. They offer a range of features. Some of these are: freeonline surveys, PollDaddy, Question Pro, Survey Monkey, Zoomerang, SurveyGizmo, SurveyPro… If you were serious it would be worthwhile to look at their features more thoroughly. I find much online content falls far short of what can be done online. It’s derived from ideas of newspaper and magazine publishing, without recognising the capabilities of the web. The web can do so much more than printing. Interactive pages, polls, some real computation power can be unleashed through a web interface. I’d love to see more of this smarter web in future. Conclusions: *In a few minutes a survey can be set up to gather worthwhile information. *This sort of thing is more attractive to me than plain text. *It takes longer to write this up than it does to create the survey. I highly enjoyed reading your post, keep up making such exciting articles! After the “free period” Free Online Surveys shuts you out of your results. You can pay to see more. If you’re going to use a survey I suggest looking for a recent survey and not using the tool I tried.